It seems like every family in America plans a Floridian vacation at some point. When the Florida summer heat becomes too stifling, adults have plenty of options for cooling off. But what are some hotels that allow kids to cool off in an appropriately sized swimming pool? 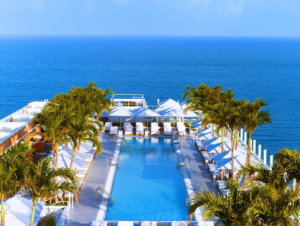 Here are a few beachfront hotels in Florida that provide kids’ swimming pools. This high-rise beachfront resort has spacious one- and two-bedroom suites with a full kitchen and washer/dryer. Guests also have a view of the Gulf of Mexico from their balcony and can take a walk on the white sandy beach. The hotel has a no-smoking policy and offers security services, and children can swim in the outdoor kids’ pool located near the bigger pool. All the rooms at the Palm Plaza Hotel in Daytona Beach have front row views of the Atlantic Ocean, private balconies, and room safes to stash valuables. Fishing and golfing packages are available, and guests can use the game room, laundry service, snack bar and heated pool, while kids can play in the outdoor kids’ swimming pool and enjoy other recreational activities. It’s only an hour from Cape Canaveral, Sea World and Disney World. 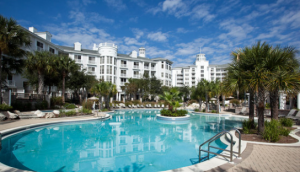 The Wyndham Palm-Aire resort is a gated community located approximately 15 minutes outside of Fort Lauderdale. It has 24-hour security. Its spacious one- and two-bedroom condos come with king-sized beds, sleeper sofas, washers and dryers, bathrooms with Jacuzzis, cable television, full kitchens and private balconies. Children can swim in the outdoor kids’ pool and enjoy special activity programs designed just for kids. Located along the white sandy beaches of Cocoa Beach, the Doubletree Hotel is just a few minutes away from the Kennedy Space Center on Florida’s Space Coast. The hotel features 148 guest rooms and suites with a view of the Atlantic Ocean, free wireless Internet access, refrigerators and microwaves. Guests also enjoy private access to the oceanfront hotel’s beach and a heated outdoor pool with a kids’ swimming pool located nearby. The Wyndham Royal Vista hotel sits right on the beach. Guest accommodations include a fully equipped kitchen, washer/dryer, whirlpool tub, balcony and separate living area. However, not every unit provides an ocean or coastal view. Adults can swim in either of the two outdoor swimming pools, while children can use the kids’ swimming pool or the playground.